Where do we start planning for differentiated instruction with technology? What are considerations for who we teach, what we teach, and how we plan? Throughout this post, you will notice a pattern of threes based on where, what and who, and finally how. Because examples often help, this post will close with one which I hope will inspire you to even better differentiation with technology. Where Do We Start the Planning Process? Curriculum: What standards and lesson objectives are appropriate? Results: What are the key attributes of the target concept to be learned? What is acceptable evidence that students are learning? Resources: What human, digital, and traditional resources are available? Let’s start with a premise: Planning differentiated instruction enhanced by technology is a perfect fit for the principles of understanding by design (Wiggins & McTighe, 2005) in which teachers plan instruction based on the results they intend for their students. This means that before any digital tools are chosen, before a single activity is determined, before assessment instruments are designed, the intended results must be decided. Results are informed by standards and further refined by lesson objectives. They are carefully honed predictions for student learning that require the teacher to determine the key attributes of target concepts and consideration for what acceptable evidence of learning might be. Once we know we have this down, the rest falls into place. Right now, you might be wondering, “Hey, where’s the technology?” At this point in our three-phase approach, we can ask ourselves what human, digital, and more traditional resources are available to support these learning events. It will be tempting to think something like, “I really love Prezi and Glogster” so I’ll design my activity around those two tools.” An analogy might be helpful here as a kind of caution about choosing the technology before moving forward with other aspects of instruction. In my backyard, I have decided to build a shed to store potting soil, extra pots, shovels, and so on. I know I have a claw hammer and a sledge hammer. I like my hammers, so I decide that those are the tools I will use. Already, you can see this will not work out well. I may need other tools, and I may even have to borrow one from a neighbor or go to the hardware store and buy a tool for this task. To be successful, I will need a pretty good inventory of the tools that are required for the job, the tools I own, and the tools I will borrow or buy. Planning to use technology to improve differentiated instruction is like that, too. The technology should match the demands of the tasks. What Do I Differentiate + Who and How? Once we have a firm grasp on what results we expect based on standards and objectives, we can begin to think about the best ways to challenge our students. Embedded in what we differentiate are considerations for who our students are and what we know about them along with what aspects of the curriculum might result (there is that word again) in effective student learning. Curricular elements we can differentiate commonly include the processes of learning, the products of learning, and the content on which learning is based (Tomlinson, 2001). Juxtaposed with those elements are the needs of the students including their readiness for learning relative to the standards and objectives, their interests relative to the standards and objectives, and the way they learn as a general rule. 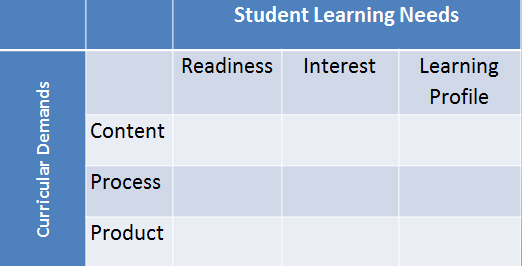 Learning needs and curricular elements or demands can be thought of as a matrix, as represented in figure 1. What cell on the matrix might produce the best learning results for the specific students sitting in the classroom? Finally, we need to decide what part of the lesson will be differentiated, how much time is available, and how this lesson fits in broader learning goals. Options: High-quality differentiation typically means different students doing different things that lead to achievement of a common learning goal. Developing options is an effective way to put differentiation into effect. Sometimes the options are choices students can make based on the information they have about their own learning needs. At other times, the options are decisions that teachers make for students or are choices students make with guidance and nudging from their teachers. Options for learning in high-quality differentiation are always made with the key attributes of the target concept and effective learning results in mind. Teachers develop options that meet identified learner needs while keeping key attributes of the target concepts and results in mind. Early in this post, I asserted that technology offers the potential for powerful differentiation that results in high-quality learning. How digital technologies are embedded in the learning tasks is vitally important. They can be simple tinkering (or micro-differentiation, as Tomlinson, 2001, asserts) or those digital tools can vastly improve how students learn and how they interact in our digital world. In choosing tools to be part of the options or choices available to students, three (remember our rule of threes for each phase?) questions can guide our thinking about what tools are appropriate and useful. What tools do my students know or might they learn to use? What digital technologies are available to the students in the classroom, at school, at home? And a corollary: What digital technologies can students bring with them to school to assist in their learning? Will the digital technologies that are part of the options for students really improve their learning relative to standards, objectives, and intended learning results? Imagine a high school English course in which students are expected to understand and analyze characters in novels they selected as part of a coming of age unit. The standard, drawn from the Common Core State Standards Initiative (CCSS, 2010) informs these differentiated tasks. RL.9-10.3. Analyze how complex characters (e.g., those with multiple or conflicting motivations) develop over the course of a text, interact with other characters, and advance the plot or develop the theme. The lesson objective relates directly to the CCSS standard; that is, students will be able to form inferences about characters from dialog and from their actions. Making inferences about characters from dialog and actions are key attributes that the teacher will use in guiding students as they work on differentiated tasks, and that will inform feedback she provides to students as they work. In the following example tasks, notice how the tools enhance the learning rather than restrict it; at the same time students are encouraged to use new literacy skills in learning as they complete the tasks. In these examples, presented as directions to students, tasks are based on student choices, provide flexible grouping arrangements, and encourage a limited range of technologies that align with the intended learning result. 1. Sometimes what characters in novels we read say speaks volumes about them. Work with someone who read a book that is different than your own. Using Voicethread or a podcast, each partner should choose a character from their respective books. Create a dialog between those two characters that is clearly based on inferences you made about your respective characters. If you choose to work with Voicethread, choose appropriate images to correspond with the dialog you create. Ask yourselves, what would these two characters from different novels say to each other about their coming of age experiences? Challenge: Can you include, in your dialog, references to characters’ actions that lead you to believe characters would respond in a certain way? 2. Sometimes what characters in novels we read do tells us volumes about them. 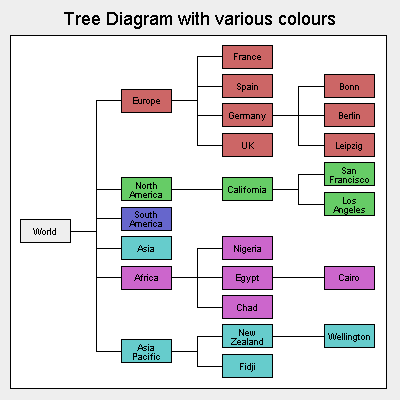 Work on your own to create a tree diagram, which includes several levels. If you would like to see an example of a tree diagram, click here. Use one of the interactive graphic organizer tools you find on the class webpage (for readers of this post, some possibilities are listed among the many tools here). At level one, identify the character and include the title of the novel. At level two, identify three or four characteristics of your chosen character that are based solely on their actions. At level three, find three or four actions in your novel that support your choice of attributes. Hint: You may want to choose the actions and categorize them, then identify the characteristics based on those attributes. Challenge 1: Share your graphic organizer with another member of your group and ask that person to add to your graphic organizer by either expanding the list of characteristics or adding to the possible actions that support the characteristics you chose. Challenge 2: Can you add a fourth level with an example from what characters say that supports the characteristics you chose? 3. Sometimes what characters in novels we read do and say tells us volumes about them. Using the Twurdy search engine, find three reviews of your novel that include analysis of the characters in the novel you read. Post your findings along with a paragraph indicating why you agree or disagree with the reviews you found. Be sure to include evidence in the form of inferences you have drawn from dialog or actions. Three to five examples will serve as evidence. Work with a member of the class who read a different book than you did to determine if there are common attributes for the characters in the two different novels. Use Google Docs to create a matrix similar to the one you see here. Share your link on the class wiki. Challenge: Can you identify a character from your novel that is like any of the characters in our reading of a Shakespeare play (or other touchstone text) earlier this year? Based on what I know about the curriculum and my students, their [interests ] are [grounded on the novels they selected to read for literature circles] relative to the objective of [character analysis]. The [product] will help students [analyze characters] because they must attend to the critical attributes of a character’s actions or interactions in dialog. In your classroom, what successful tasks have you designed with the end in mind that were built on solid principles of differentiation and use of digital technologies? Use the comment button to add your thoughts to the conversation. Tomlinson, C. A. (2001). How to differentiate instruction in mixed-ability classrooms, 2nd ed. Upper Saddle River, NJ: Pearson. Tomlinson, C. (1999). Differentiated classroom: Responding to the needs of all learners: Alexandria, VA: ASCD. Awesome, Awesome focus. Thank you for sharing. Pretty greatt post. I simply stumbled upon your weblog annd wished to say that I have really enjoyed browsing your weblog posts. In any case I will be subscribing in your rss feed and I am hoping youu write again very soon!